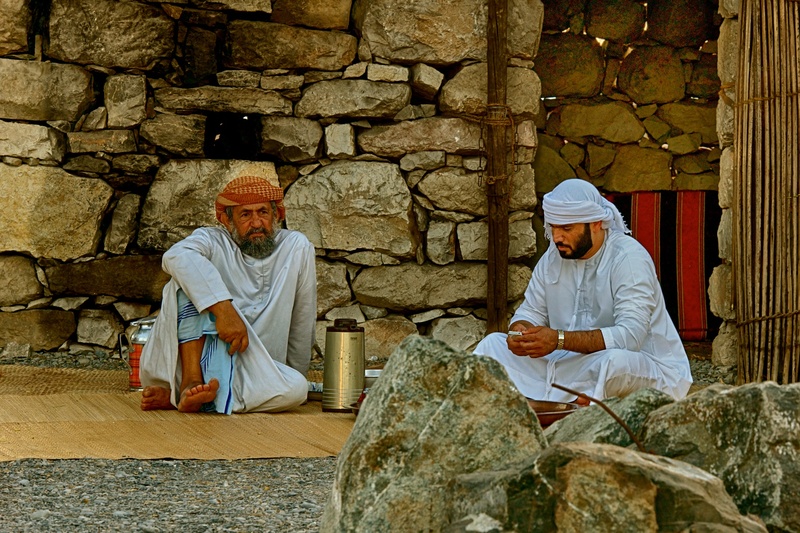 Emirati or Emirian people (Arabic: إماراتي‎) are citizens who speak the Arabic variety of the United Arab Emirates (UAE). Emirati people are ethnically diverse. Many Emiratis originate from the Bani Yas tribe, there are also many Emiratis of Persian descent (Sunni and Shia). There are also Emiratis who originate from Palestine, Zanzibar, Yemen, Oman, Bangladesh, Madagascar, India, Pakistan and Saudi Arabia. They are very hospitable people, during evening, they sit in front of their house with a pot of tea. Anyone passing in-front of their house gets invited to share the tea. What is also interesting in this frame is to see the old man, deep in his thoughts and the young man busy in his mobile phone.